A cold winter's day is the perfect time to enjoy a mug of hot chocolate- one of our favorite family beverages At our house; we prefer to make our own large-sized tub of hot cocoa mix rather than buying those expensive single-serving pouches at the grocery store. And we think this recipe for homemade hot cocoa mix tastes better too! This is so easy to mix together- that my kids can do it themselves! At our house, we prefer to make our own large-sized tub of homemade hot cocoa mix rather than buying those expensive single-serving pouches at the grocery store. And we think this recipe tastes better too! Mix all of the ingredients in one large tub until well blended. Add hot water to 3-4 tablespoons of the homemade hot cocoa mix and stir well! Add marshmallows if desired! Enjoy! The plastic container that I use to store our hot cocoa mix is a recycled food container from a prior use in my home- I can't even recall what was originally in it! But you can find a similar one here from Rubbermaid This is an affiliate link: MomOf6 earns a commission if you purchase, at no additional cost to you. 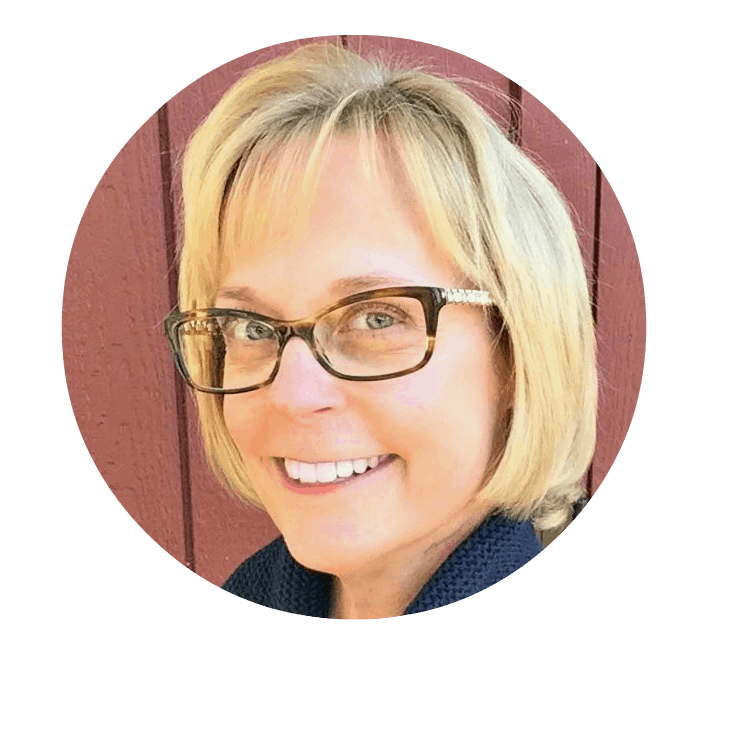 in the 6-quart size ( lid sold separately This is an affiliate link: MomOf6 earns a commission if you purchase, at no additional cost to you. ). 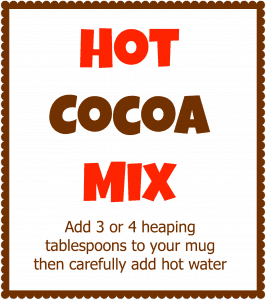 If you'd like to print a copy of the label I created, simply sign up below to join the MomOf6 Busy Moms Community, and you'll be directed to a thank you page with the free printable Hot Cocoa Mix label! « How to Make An Easy Gingerbread House! Is the 3-4 heaping tablespoons of mix added to about 8oz of liquid? I am making a large quantity at one time for a party in a Cocoa-Latte machine and I’m trying to judge approximately how many tablespoons per 8oz of water/milk. Yes 3-4 tablespoons per cup (8’ish oz) of hot water! Enjoy! So you use regular sugar or powdered sugar? I have seen other recipes using powdered so wanted to be sure. Thank you! More sugar than cocoa! Yikes! This kills Michelle’s anti-obesity campaign! 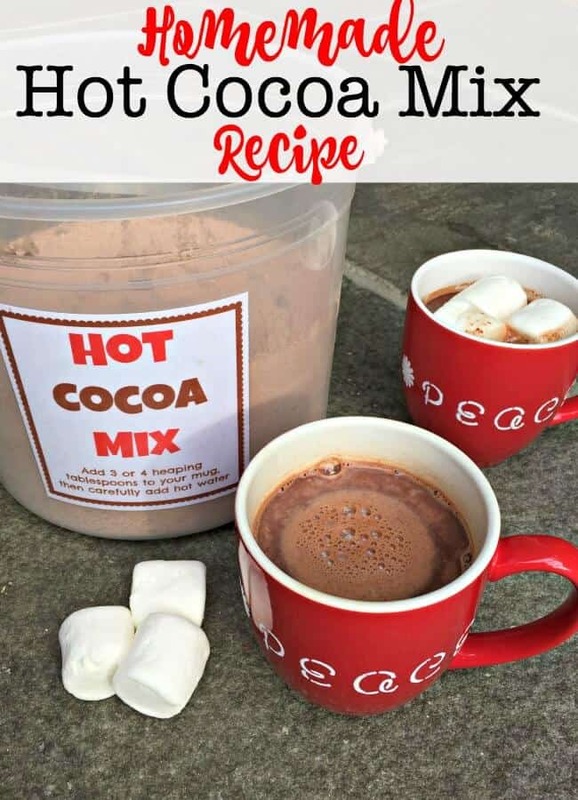 I love this idea of making your own hot chocolate mix! While we don’t have anywhere near the weather you are expecting, my guys get cold after riding home from school and this would be a great (inexpensive) way to greet them. Thanks! Thanks Connie! And I agree- hot cocoa is good even when it’s not-so-cold outside!